The church, located on a site which has been occupied by man since the Gallo-Roman period, comprises a central tower belonging to the original Romanesque church, built around 1086-1090, a flat chevet choir dating from the early 12th century and a nave which originally boasted side aisles, unfortunately destroyed in the early 18th century. Its sculpted modillion and chequered decor is typical of Norman architecture. 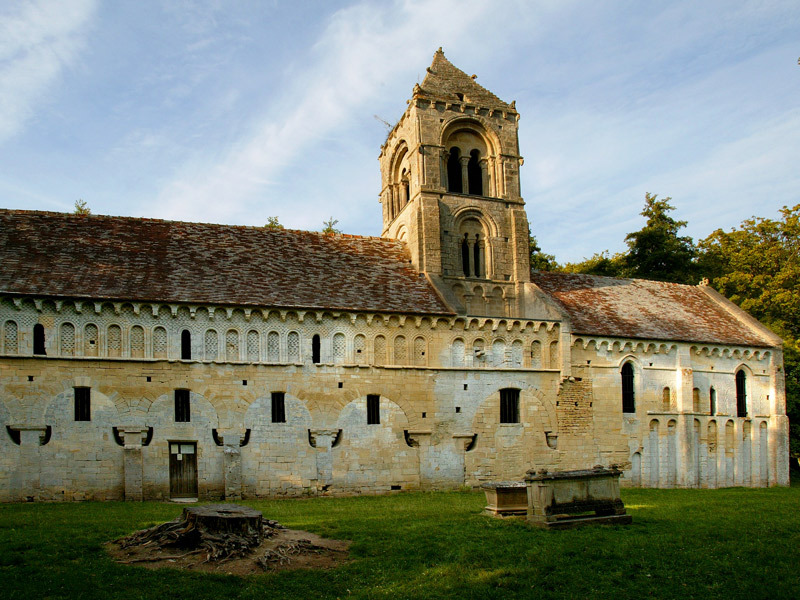 Built between the 11th and 12th century, the Church of St. Peter in Thaon is a typical example of Norman Romanesque architecture. Other churches built during the same period, such as Notre-Dame Cathedral in Bayeux, were restructured over the centuries – this is not the case of the Church of St. Peter in Thaon. Indeed, although initially built in Norman and Romanesque styles, the majority of places of worship at the time gradually evolved towards Gothic architecture. Each parish modified the overall architecture of its church by adding side aisles or naves. As such, today, very few churches are truly representative of the Norman Romanesque architecture that was so appreciated by William the Conqueror. The Church of St. Peter in Thaon is a fine and rare example, which earned the edifice its inscription as a Historic Monument as early as 1840. Major work was conducted from 1729 to 1772 in order to improve light and to extend the church. A sacristy was created behind the choir. However, from 1792 to 1796, during the Reign of Terror, the church was transformed into a saltpetre workshop. Nevertheless, it regained its use as a place of worship as from 1803 and until the construction of a new church in 1840. The church was then closed, without for as much falling into neglect. Over the following centuries, archaeologists, antique dealers and art and architecture enthusiasts have regularly flocked to admire the building’s great beauty. Restoration projects for the church were initiated in the late 19th century. In 1994, the spire was under threat of collapse and urgent repair was undertaken in order to preserve the church, thanks to support from the Association des Amis de la Vieille Eglise de Thaon. A further restoration campaign was launched in 1998 by an archaeologist and anthropologist. Excavation work was conducted concurrent to restoration, rendering the project one of the most important campaigns on a still-standing edifice in France.